Does this park have restrooms? 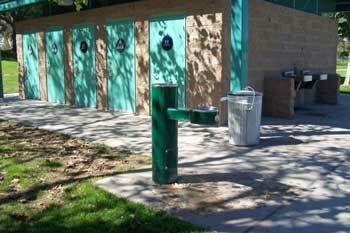 There are two restrooms for males and two restrooms for females. Why is it important to put trash in trashcans? 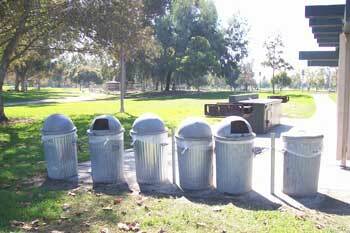 Putting trash in trashcans keeps the park pretty so everyone can enjoy it. The first sign means "no swimming". 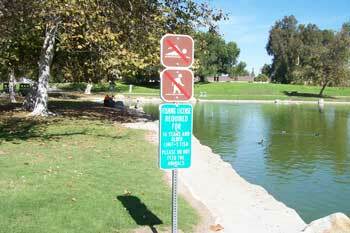 The second sign means "do not walk in the lake". Be sure to obey the rules at the park. The rules are posted on signs. Copyrights to the pictures and photos on this ESL and EL Civics website belong to individual photographers. We have purchased the rights to use them. Do not copy the images on this education website. You may print any of the worksheets for classroom or home study. Contact Christina Niven at christina@elcivics.com. Please send corrections and requests for new lifeskill lessons. Copyright © Christina Niven, 2007.